Time-lapse: Planetary Panorama by Vincent Brady. If I have but one complaint when I go outside to soak in the splendor of the heavens at night, it’s that I can only see one small part of the sky at once. This is not the fault of geography, trees, or buildings blocking my view. It’s evolution. Or specifically, the result of endless random mutations guided by environmental pressures that have placed both our eyes in the front of our head, limiting our view. This has distinct survival advantages (like binocular vision providing depth) but sadly means our own heads are in the way of more than half the sky. But inside those heads are brains, and those brains live to solve such quirks of biology. 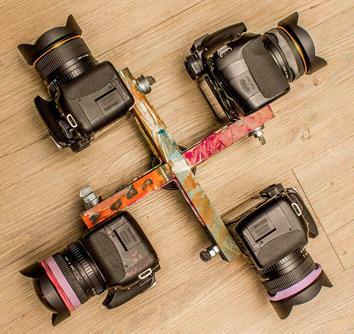 For example, we invented technology that allowed us to build cameras with wide-angle lenses, and specifically allowed photographer Vincent Brady to mount four such cameras pointing in four different directions. 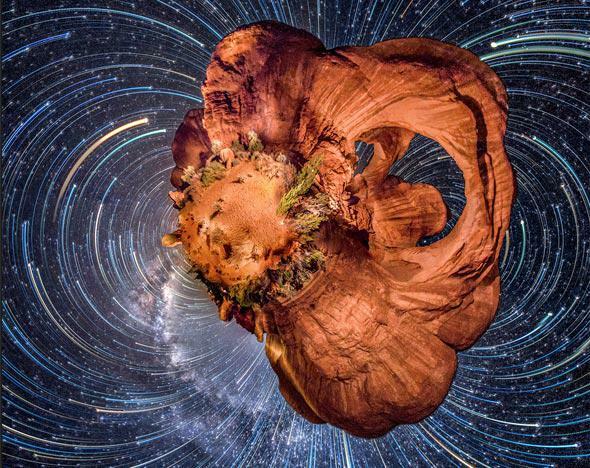 His clever and artistic brain then used software to stitch together the resulting images to create a jaw-dropping and substantively beautiful time-lapse of the entire sky at once. That is so cool! And there are a couple of things worth explaining. Of course. Brady’s rig, with four cameras pointing in different directions. But there’s more! Once the images are stitched together, they can be mapped into different shapes. Just like you can take a map of the Earth and turn that into a spherical globe, a flattened Mercator projection, or any number of other types of shapes, you can do that with the sky as well. Brady reshaped the pictures several ways in the video, including using a (more or less) flat horizon facing east (at the 0:15 mark), which makes the stars rise out of the middle of the frame, and the same thing but facing south (at the 1:55 mark) and west (at the 2:19 mark) … all of which make the sky look very odd indeed. What fun! And all of this just from looking in all directions at once, and applying a little math to the result. I have to admit, I found it very disorienting (in a fun way) trying to pick out constellations and familiar landmarks in the sky during the video. Our puny human brains aren’t used to processing information this way and can get pretty twisted up when presented with information that’s out of the ordinary. I think that’s all for the better. Our brains are pelted with information all the time, and sometimes it doesn’t necessarily jibe with how we think we see the Universe. But we may not be seeing it correctly! I think a good old jolt to the gray matter is an excellent way to make sure we don’t get complacent, and to ensure we don’t get too stuck in our views.